Micro-Mark offers a selection of hard-to-find miniature taps, dies and bits for a wide variety of projects, including model building, clock-making, instrument repair and fabrication, watches, machining and machine work, component assembly, and more. Clearance Drills are bits of the correct size for drilling a hole just large enough for the shank of a corresponding-size screw to pass through without touching, such as the hole in a washer. The holes made by clearance drills are not to be tapped. 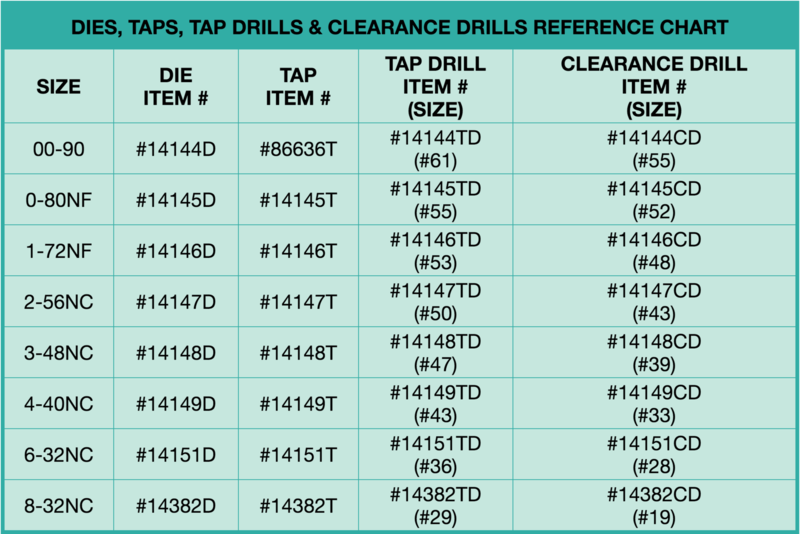 See the chart below for Tap, Die and Drill size reference. For additional information, an explanation of Taps and Dies follows the chart. Tap and Die sizes follow the same naming standards as machine screws; shank size - threads per inch. For example, a cylinder threaded with a 0-56 tap would hold a size 0, 56 thread-per-inch screw. TAPS are used to cut screw threads into the walls of a previously smooth cylindrical hole or bore. DIES are used to cut screw threads into the surface of a smooth rod or other cylindrical stock. 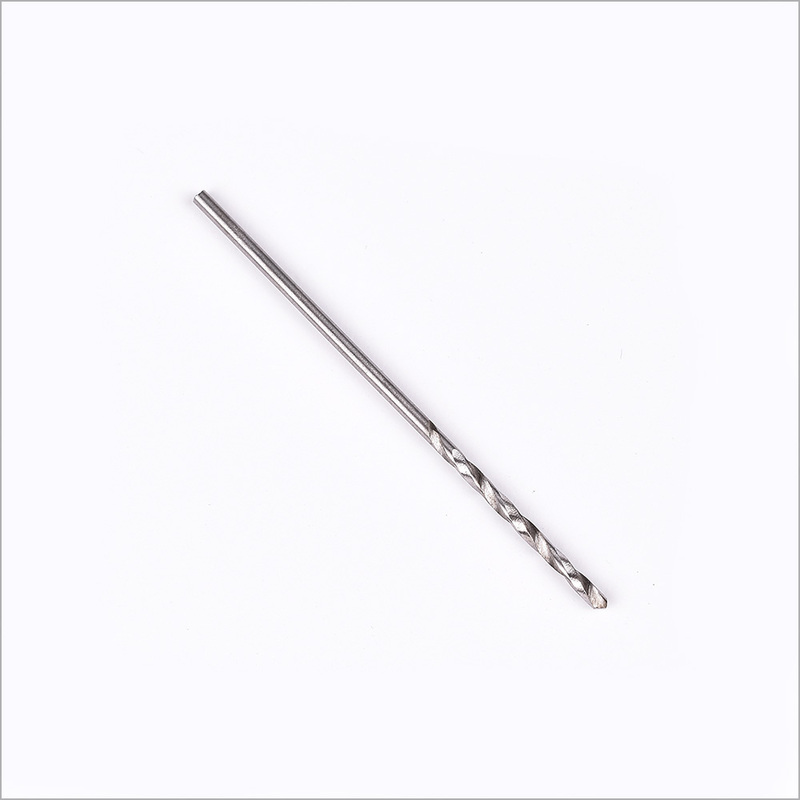 TAP DRILLS are bits of a precise size which are used to bore out cylindrical holes in a material or component before creating screw threads with a corresponding-size tap. CLEARANCE DRILLS are bits of the correct size for drilling a hole just large enough for the shank of a corresponding-size screw to pass through without touching, such as the hole in a washer. The holes made by clearance drills are not to be tapped. Example: Use a 00-09 Tap Drill to make a hole in a component which must be joined to another component. Create screw threads in the hole previously drilled into the component with a 00-90 Tap. Use a 00-90 Die to cut threads into a bit of brass rod, making a custom screw. Using a 00-09 Clearance Drill, bore a hole in a circle of brass to create a washer that will be placed between the head of the custom screw and the component. Swivel Hd Pin Vise 0-1/8"